A comprehensive range of Welmin dairy mineral supplements are manufactured catering for all the needs of the modern dairy cow throughout her production cycle. 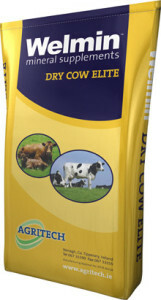 Welmin Dry Cow Elite is developed to meet the demands of the high production dairy herd during the dry cow period. It supplies a unique blend of mineral and vitamin supplementation for the developing foetus and ensures that the cow’s immune system is adequately strengthened to deal with the rigours of the calving and transition period. Multi source inclusion of organic and chelated trace minerals optimising bioavailability, reproduction, immunity and performance, backed by worldwide research from leading brands of ingredients. High inclusion of vitamin E, supplying 10,000 iu/kg along with other essential vitamins and amino acids for improved health, immunity, reduced metabolic disorders, e.g . retained placenta, and aiding uterine cleansing post calving. High in magnesium and phosphorous. Multiple organic sources of protected trace minerals. Contains yeast with high concentrations of β glucans and MOS. Welmin Dairy Elite is our superior specification formulation for the high yielding milking dairy cow. With continuous production throughout the year, mineral supplementation is vital through the full lactation to ensure a healthy and fertile animal and to maximise milk production. High vitamin and amino acid inclusion to optimise udder health and improved immune status. B vitamins play important roles in the production, reproduction and immune systems of the animal system. Added yeast is ideal nutrition for ruminal flora optimising performance and milk production. Biotin supplemented during lactation for increased milk production and improved fertility and reduced foot lesions. Welmin Dry Cow is formulated to ensure adequate supplementation of the key minerals and vitamins during the dry cow period to boost the well-being of the dairy and suckler cow. Includes all the essential trace minerals to meet the demands of the dry period ensuring healthy calves which are up suckling soon after birth. Magnesium and high vitamin D inclusion will aid in counteracting clinical and subclinical milk fever and associated metabolic disorders, e.g. lazy calving, retained afterbirths. Organic selenium – for optimal selenium status. Welmin Dairy Boost is formulated to enhance and support the productivity of the lactating cow, improve calving interval and herd replacement index of the breeding herd. Contains a high phosphorus level – 8%. Generous levels of copper and organic selenium included for enhanced bioavailability. Zinc, copper, iodine and selenium from multiple sources will play a pivotal role in maximising the absorption of the essential trace minerals in the critical fertility period post calving. High levels of vitamins including vitamin E and B12. Welmin Dairy Boost gives an excellent return on investment. Welmin Cereal Forage Beet Balancer is formulated to meet the needs of the dairy cow or beef animal where there is a greater requirement for phosphorous in the diet. High in available phosphorous (14%) to balance low phosphorous in maize, fodder beet and other root crops. Includes all the key essential trace minerals including chelated copper and zinc which contribute to improved conception, performance and overall health for a high performing dairy cow or beef animal. With added yeast for ruminal flora, optimising performance and milk production. Welmin High Magnesium is specially formulated to assist in the prevention of grass tetany, due to Magnesium deficiencies. It has 25% Magnesium and is designed to be extremely palatable and dust free. Provides 30grams of essential magnesium per head per day for reduced losses due to grass tetany. Magnesium is essential for bone, soft tissue, and body fluids. Fully mineralised supplement including copper and vitamins A, D3 and E.
A very cost effective approach. Welmin Thrivovit SCC is scientifically formulated to meet the cow’s daily requirements of the vital trace elements that are most deficient in Irish dairy herds, each of which are vital to healthy bodily functions. High inclusion levels of chelated zinc for reduced somatic cell counts and reduced lameness. Low phosphorous – Low calcium mineral suitable for all year round feeding, even in dry period if calcium is required. Multi source of copper inclusion for optimum supply and bioavailability. High vitamin and amino acid inclusion to optimise the cows genetic potential and maintain top condition. Dietary cation-anion difference (DCAD) is a measure of the levels of four macrominerals in the diet, potassium and sodium – positively charged cations and chloride and sulphur – negatively charged anions. DCAD affects blood buffering capacity and acidity in a cow’s blood. A negative DCAD is desirable for the 14-21 days prepartum. Lowering DCAD to -8 to -12 meq per 100g ration dry matter increases blood calcium levels prior to calving which helps prevent milk fever, reduces udder oedema and can lead to fewer retained placentas and displaced abomasums. To determine DCAD levels forage testing is critical and the DCAD calculation can be made. Feed 14-21 days prior to calving if high risk of high DCAD. AGMAG is a concentrated magnesium supplement also containing chelated copper, selenium and iodine, which is diluted by the farmer and administered to stock through the drinking water via a proportioner pump or Compsey dispenser. AGMAG is supplied in 20 litre containers, to be diluted by the farmer prior to use. AGMAG must be shaken well before mixing. It is important that only the treated water is available. Aqua Trace is a is a highly bioavailable liquid trace mineral supplement supplying Phosphorous, chelated copper, zinc & manganese, and also cobalt selenium & iodine. Deficiency in minerals can cause the farmer huge financial loss in terms of infertility and health problems. By providing the correct balance through liquid mineral supplement particularly when animals are on pasture you can help to alleviate potential deficiencies. Chelated minerals will give greater bioavailability to the animal and is more readily absorbed into the blood stream of the animal and reduces interference from antagonists. This solution can be administered simply through the drinking water either via a proportional pump or a dispenser into which the desired daily dosage amount is added. For use with proportional pump, dilute into 180 litres of water. Designed to supply required nutrients during the summer period together with a highly active concentrated garlic extract to repel flies and other insects. When the natural garlic compounds are consumed by the animal, they are secreted through the skin pores and act as a natural fly repellent. If animals are stressed from constant attack by biting insects, their performance suffers. High concentration of essential minerals and vitamins. 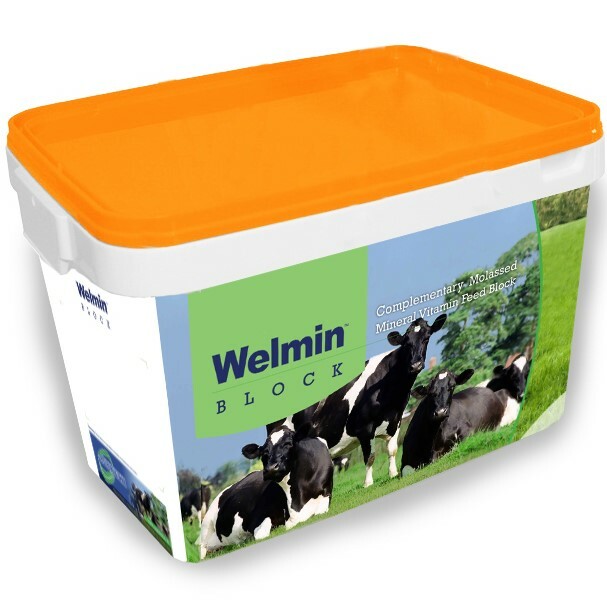 Welmin Dry Cow Elite Block provides superior levels of organic and chelated trace minerals together with all other essential minerals and vitamins to ease the demands of the transition phase in the dry cow. Contains 4,000 iu/kg of vitamin E and organic Selenium. This level of antioxidant and organic selenium provides the in-calf animal with a super boost ahead of calving to sustain her through the calving process. 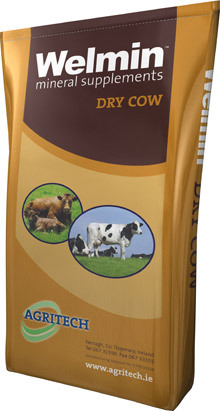 Provides the dry cow with the extra essential trace elements including copper and zinc, which gives greater mineral bio availability to the animal. Low calcium and high magnesium helps reduce the incidence of milk fever after parturition. Welmin Super Cow Fertility is a high mag fertility block with 15% magnesium and the added benefit of chelated trace elements and vitamins. This is an ideal block for the farmer who requires magnesium and also has fertility as a priority in their herd. Suitable as Dry Cow and post calving fertility block. Provides essential magnesium for reducing the risk of grass tetany in both dairy and beef cows. Ideal for the intensive farmer whose herd requirements demand a higher specification. The inclusion of copper, zinc and manganese allows for greater absorption and bioavailability. Welmin High Mag 20 is an economic 20% magnesium block in a highly palatable molassed base. The higher magnesium levels together with the essential trace elements will provide the beef and dairy cow with a source of magnesium which will further help reduce the risk of grass tetany especially when grass supply is plentiful and intakes of mineral may be reduced. Suckler cows are most at risk to tetany in the autumn due to the stresses at weaning. Welmin Optimate Omega 3 Energy & Protein is a new feed block for milking cows and all young stock over 200kgs. It is a unique feed block containing high levels of omega 3 salmon oil with protein from multiple sources, protected protein from protected soya and extra protein from the added yeast, together with good levels of trace elements and vitamins. Feeding omega 3 fatty acids contained in fish oil to breeding stock has the potential to improve fertility, reduce embryo loss and enhance general health and appearance of the cows. For young animals the benefits will be a stronger immune system with improved health and thrive and a noticeable shine to the animal coat. When fed at grass the high energy levels allow the animal to utilise the high protein in fresh grass. To buy our Welmin Dairy Mineral Supplements, contact your local distributor.